Say "Don't melt me!" 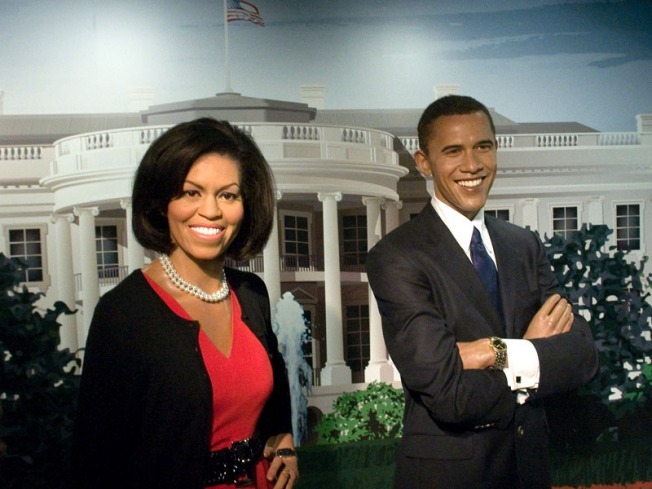 The wax figure of First Lady Michelle Obama stands next to wax hubby and U.S. President Barack Obama's likeness at Madame Tussauds in Washington, D.C.
Madame Tussauds in D.C. is going green. And they're hoping to draw a few people into the wax figure-filled attraction in the process. Starting Monday, the museum will melt $5 off their regular admission ($20 for adults, $15 for children ages 3-12) just for showing your Metro SmarTrip card. They even put Abraham Lincoln, Madonna and Rosa Parks -- the wax versions, of course -- in D.C. pedicabs Saturday to help mark "World Car Free Day'' next week. The museum says it's urging area residents to reduce their carbon footprints by bicycling, taking mass transit or walking instead of driving a car. Which is pretty easy for them to do since they're a hop and a skip away from Metro Center or Gallery Place/Chinatown. The show-me-your-SmarTrip card* promotion runs through Sunday, Sept. 27. *Yeah, we made that name up. But the promotion's still real.